Tucked away in a pile of cushions and beanbags on a chilly winter‘s afternoon in a busy school holiday programme was where I donned my test pilot gear to review this book. Fifty four, 5 – 13 yr olds with their humour and honesty would be a pretty good guide. Judging the book purely by its cover the majority vote from the group was that it was likely to be a story that perhaps the 5 -6 yr olds would love and not cool for anyone else. By the time the first three pages were read, wider appeal was obvious with a drop in the noise level, a decrease in the jiggling and wriggling of bodies and some older children, snuggling in closer to get a good look at the illustrations. It was proving to be a story that related well to children who already had an interest and connection in their own lives to rugby, nature, farms, mud, food, fishing, family and our mighty All Blacks. Such strong connections creatively threaded together in rhyming, witty words are this book’s real strength. At the end, when we had all munched on our own chocolate fish that I had tucked in my bag, the votes were in. 53 children scored it 8 or more out of 10 and it would probably appeal mostly to 5 – 9 yr olds. 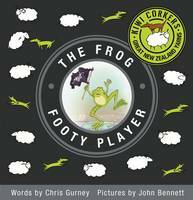 This entry was posted in Book review and tagged 9781775430575, Chris Gurney, John Bennett, rugby, Scholastic, The Frog Footy Player by booksellersnz. Bookmark the permalink.